The Bradys get groovy, The Partridge Family goes on the road, Good Times and What’s Happenin’ lay down some serious urban slapstick, Happy Days ignites a tidal wave of nostalgia, and reality-based sitcoms like All in the Family show a few cracks in the American dream. Meanwhile, Mary Tyler Moore introduces us to her surrogate workplace family, single parents like Alice break new ground, and Aaron Spelling christens the first of his floating love fantasies. This entry was posted in PrimeTime and tagged 1970 by Skooldays. Bookmark the permalink. The moderators forgot the TV show: “Quark” starring Richard Benjamin. This program was a “science fiction” parody. 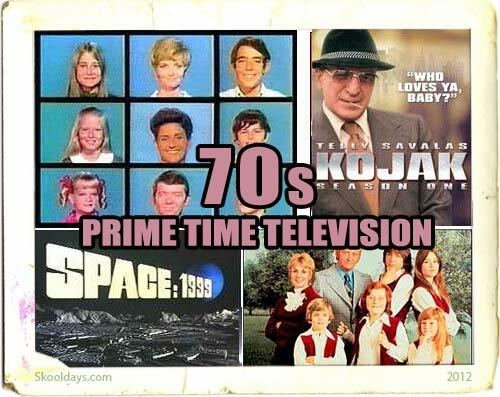 It aired in1978 and only lasted four weeks. Way back in the 70’s I had a castle building kit, containing hundreds of cream plastic bricks, flecked with browns to look realistic. I think my parents bought it in France, but can’t be sure. I was only 10, at most. I would love to own it again, but can’t remember what it was called. The box was tall, pale coloured, 50p shaped, full of different shaped bricks, so I could build round towers as well as square. Any hints or help would be greatly appreciated.